Susan of SK-Art Photography will be out with the camera close to Rivington Hall Top Barn each Sunday. Located alongside the imposing Rivington Hall, at the heart of Rivington Country Park, the magnificent Grade II listed Rivington Hall Barn is one of the North West’s most impressive and unique venues for weddings, social and corporate events. The Barn is approximately 4 miles from junction 6 on the M61, 8 miles from Bolton and is easily reached from Manchester and all parts of the North West. Rivington Barn is the perfect setting for any occasion. The impressive structure, which is of Saxon origin, and the grounds of Rivington Hall offer a unique location for every type of event from weddings and celebration parties to formal and business functions. 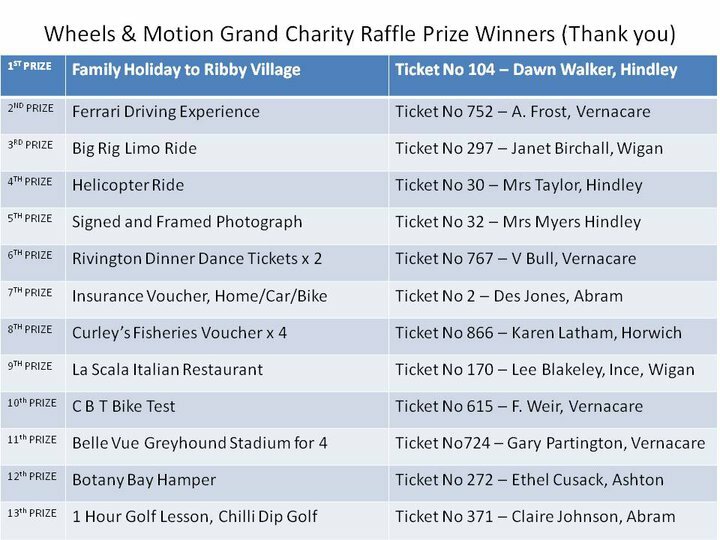 A huge thank you goes to the companies listed below that so generously donated a wonderful assortment of prizes to the Grand Charity Raffle held at the Exhibition. A huge thank you to all the people involved with the Wheels and Motion 2 Charity Photo Exhibition. A total of £2430 has been raised so far and we are trying to have a final push towards our target of £3000. The money raised will be distributed between Help for Heroes, The North West Air Ambulance and Bolton Mountain Rescue Team. SK-Art Photography are currently displaying at Rivington Hall Top Barn each Sunday from 11am until 5pm. On display is a slideshow of Rivington Bikers, Oulton Park Track Days etc. Also on display is a sample of work and a selection of portfolios for you to view at leisure (subjects include) BSB, Preston and District Motorcycle Club, Supermoto, BSB, Rivington and Belmont Bikers plus many more. From each sale a donation is made toward the charities supported. Susan is the sole photographer for SK-Art and for the fundraising events organised by the company. Susan spends from approx 1pm until 4pm each Sunday over Belmont catching the local bikers (weather permitting). Susan also spends a lot of time at Oulton Park Track Days catching the action shots. Wheels and Motion 3 looks set to be taken onto the Fylde at the request of Ribby Hall Village who have asked to be our host. During the weekend of the exhibition, there will be limited Help For Heroes wristbands available, in both adult and children sizes. Recommended donation £2.00. We have our second fundraising Wheels and Motion 2 Charity Photo exhibition next weekend raising funds for Help for Heroes, The North West Air Ambulance and Bolton Mountain Rescue Team. The event will take place at Horwich R M I Social Club on Ramsbottom Road, Horwich on the 20th and 21st November and will open at 10am on both days until 5pm. It is a totally free event with a grand charity raffle and bucket collection to raise the funds. A collection of over 200 photos including work from the Isle of Man TT Races, British Super Bikes, Preston and District Motorcycle Club, NG Road Racing, Supermoto, Motocross, Truckfest Haydock, Pet photography, Sunsets and many more subjects. A slide show of Rivington and Belmont Bikers taken from as far back as last October will be available to view at leisure. Over the weekend we will have the Big Rig Truck Events 'Big Rig' (huge American Truck) on display which is truly a sight to behold as it has been lovingly and so meticulously designed by the owners for weddings, proms and special occasions, not to be missed. The Jack Daniels Road Show is with us on both days displaying their Jack Daniels Custom Harley Davidson along with their BBQ and live entertainment. Also we have a return visit of the lovingly restored Brough Superior on the Saturday afternoon which amazed a lot of people last weekend when the owner Jeffrey took a visit to Rivington Barn, much to the delight of the local bikers. Bolton Wanderers Football Club are also kindly supporting the Exhibition. Lofty will be coming along to visit us at 10am until 10.30 then he is back again at 4.30pm until 5pm so if you fancy your picture taken with Lofty, please come along. Bids can also be left via the website www.SK-Art.co.uk where you can email your bid along with your contact details. 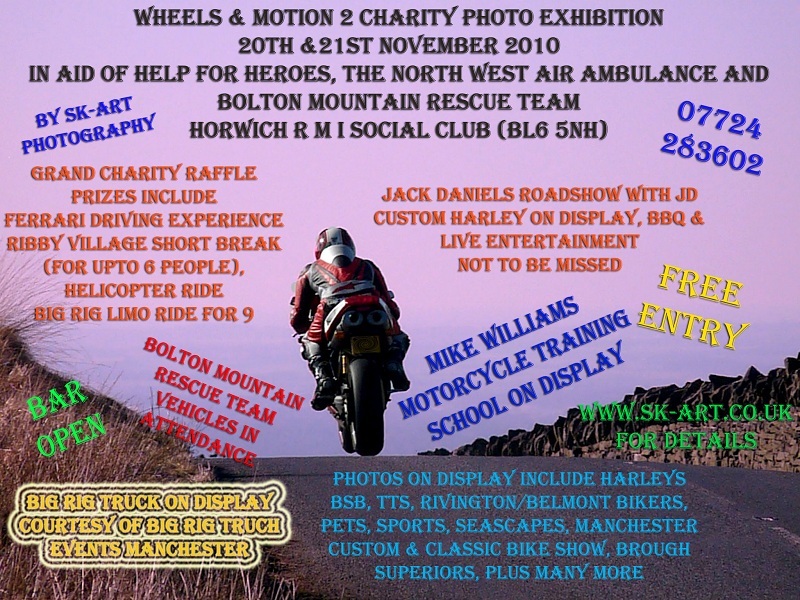 The Wheels & Motion II Charity Photo Exhibition is set to return on Saturday 20th and Sunday 21st November 2010 and is scheduled to be held at to Horwich RMI Social Club. The exhibition is being run to raise funds for Help For Heroes, North West Air Ambulance and Bolton Mountain Rescue. Custom Bike Show on Saturday 04th and Sunday 05th September 2010, in aid of Wigan Cardiology Unit. Featuring live music, drag bike demo, BBQ, trade stalls and raffle. Find us at Unit 3 (1), Walter Leigh Way, Moss Industrial Estate, Leigh, Lancashire, WN7 3PT. To book your bike into the show or for general enquiries, please call 01942 673 853, or e-mail saf@notafridge.co.uk. Rivington Village Bowling Club was a beautiful setting for the Wheels and Motion Charity Photo Exhibition held on 19th and 20th June 2010. A family run tea room in a beautiful lakeside location with a warm and welcoming atmosphere. Serving refreshments with an all day bar and indoor/outdoor seating. A second charity exhibition is planned so please keep checking back for details.